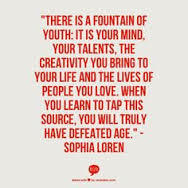 I love the saying by Sophia Loren. A woman who lived her life on her looks. Added a link! Glad to participate. Today is Canadian Thanksgiving and I am thankful for you and Senior Salon!! Have a wonderful day. Sophia Loren has it right !